Newton's Nook Designs 5 Year Celebration Blog Hop! Welcome to the Newton's Nook Designs 5 Year Celebration Blog Hop! I hope you've enjoyed the reveal week and are ready to place your order today because the new products are available for purchase in the Newton's Nook Designs Shop today! I know it is so hard to pick which sets to order first, especially with such a big, fabulous release this month! 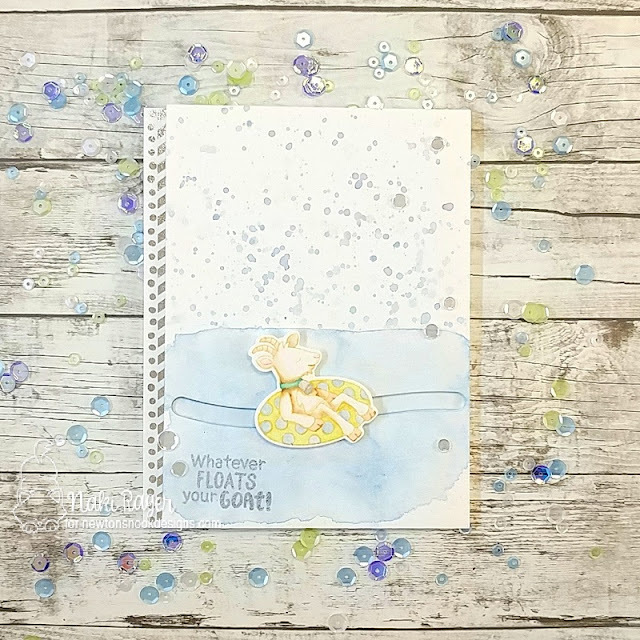 So let us inspire you a little more and hopefully help you make your decision! I have a pair of birthday cards to celebrate Newton's Nook Designs' 5th anniversary! 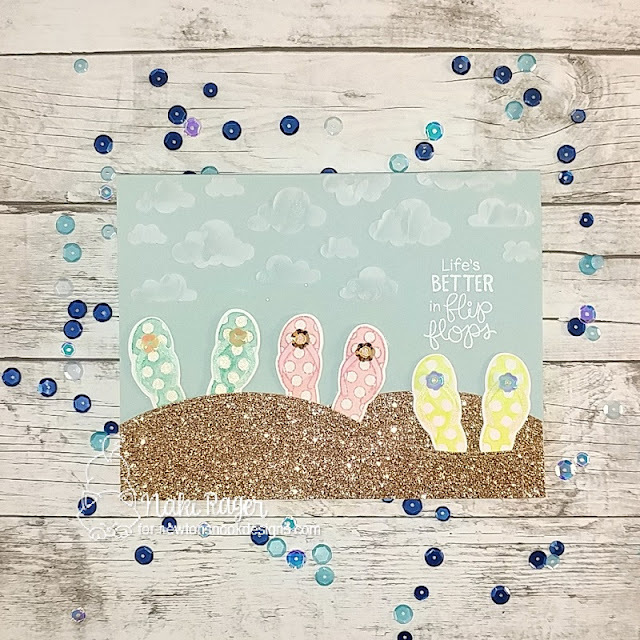 I love shakers, they're just so pretty and so fun with tons of sequins and confetti and bead seeds 💗 And celebration should be fun just like shakers! I do love these big stamps, and the Shark Frenzy Set is simply awesome! For my Kai, I heat embossed the image with silver EP and waterolored with pearl colors. I colored them in fun colors like a few shades of blues, silver, yellow, purple, and orange for the hammerhead shark. 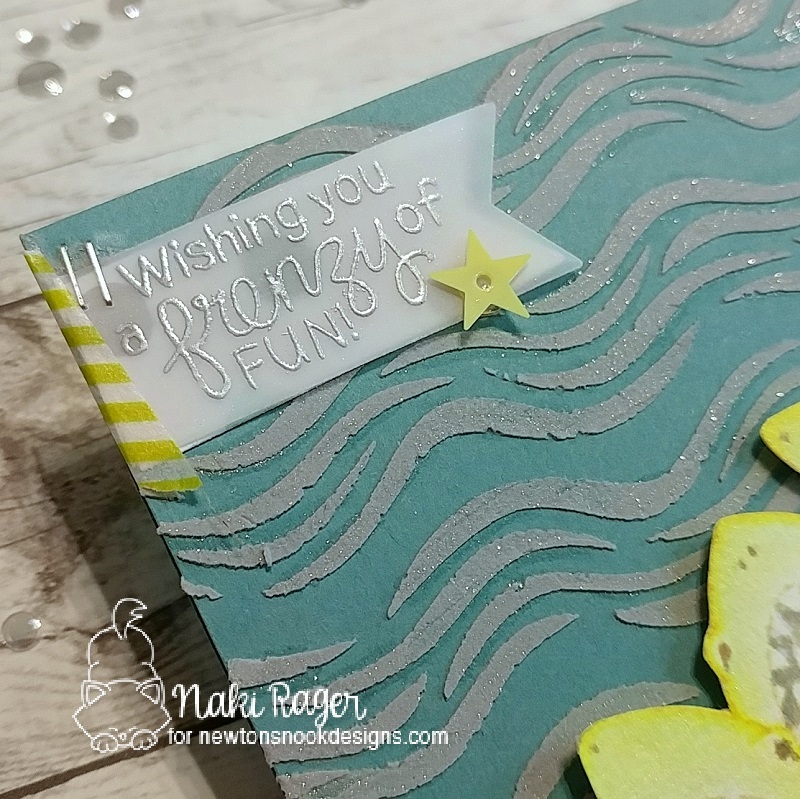 I die cut the frame from dusty blue cardstock and acetate sheet using the Framework Die Set. I cut out the window using the regular paper trimmer. I added a bunch of confetti and bead seeds, and 5 of silver glittery number 5s die cut using the Essential Alphabet Die Set. The sentiment is from the Birthday Essentials Stamp Set and was heat embossed with aqua tinsel EP on vellum and fussy cut, then ran through the Xyron sticker maker to add adhesive. 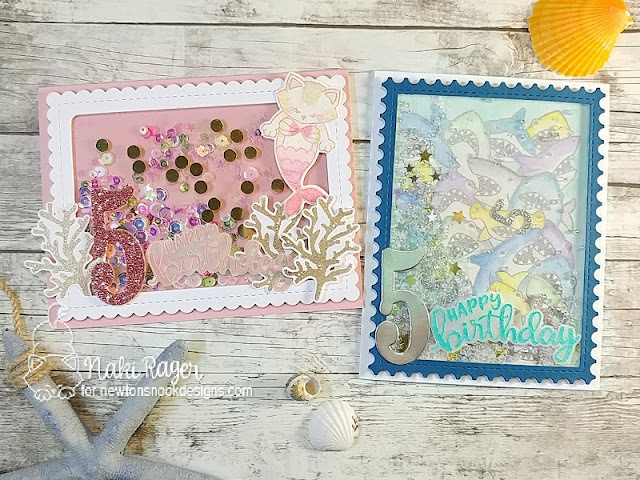 I heat embossed my purr-maid with rose gold EP and watercolored with pearl colors (yes, even her fur! 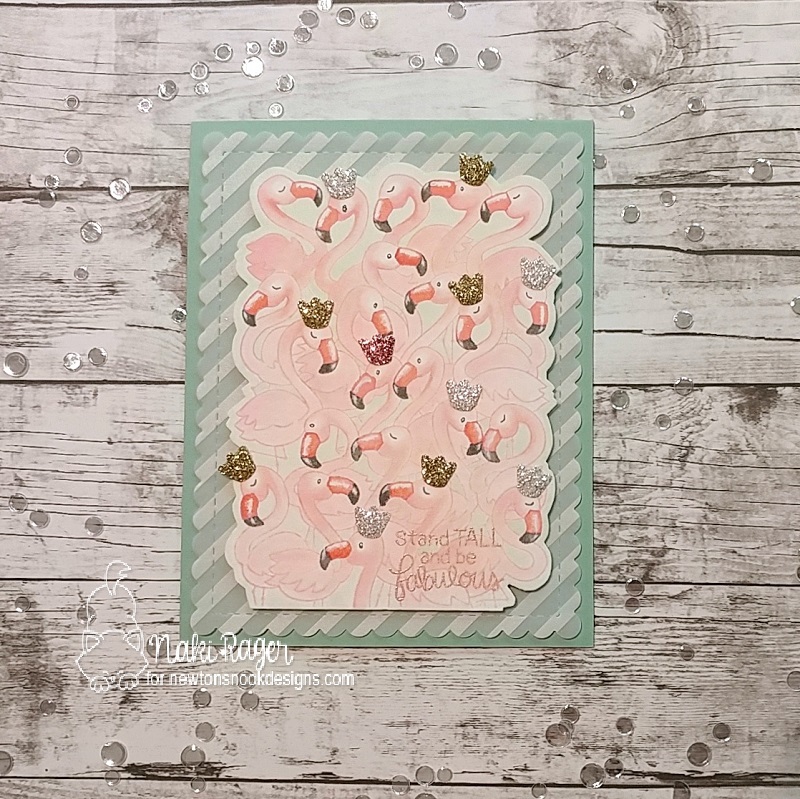 Mermaids are sparkly everywhere and I'm just trying to be true...LOL) then die cut using the coordinating die. 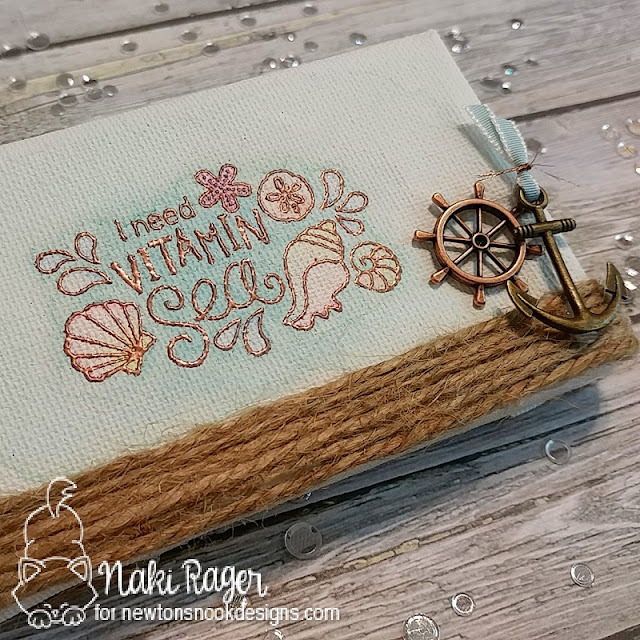 I borrowed the branch coral from the Tranquil Tides Set and it was heat embossed with gold tinsel EP and die cut with the coordinating die. I used the same sentiment from the Birthday Essentials Set and it was heat embossed with rose gold EP on vellum and fussy cut, then ran through the Xyron Sticker Maker. I filled up this card with a bunch of mermaid colors, which are pinks, purples, greens, and gold ;-) The frame is from the Frames & Flags Die Set, I just cannot stay away from those dies! 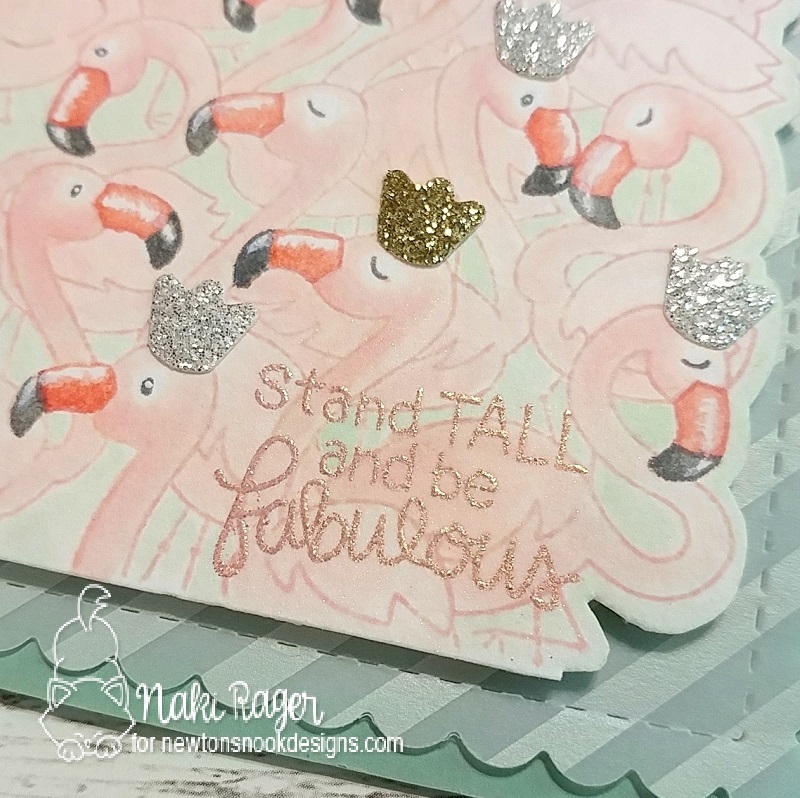 The celebration isn't over yet! 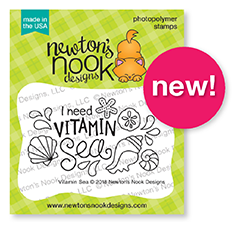 Look at this awesome sale over at the Newton's Nook Designs Shop! 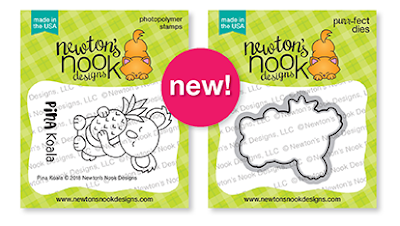 Welcome to the final day of the Newton's Nook Designs 5 Year Celebration! 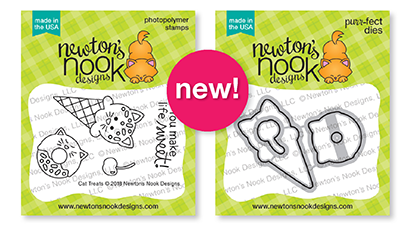 All the new products will be available for purchase tomorrow Friday the 20th in the Newton's Nook Designs Shop! 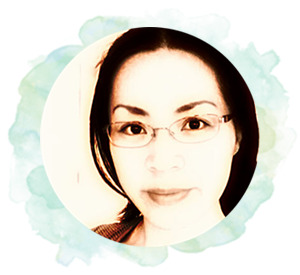 This week has been so exciting but just wait till what you see today...!!! 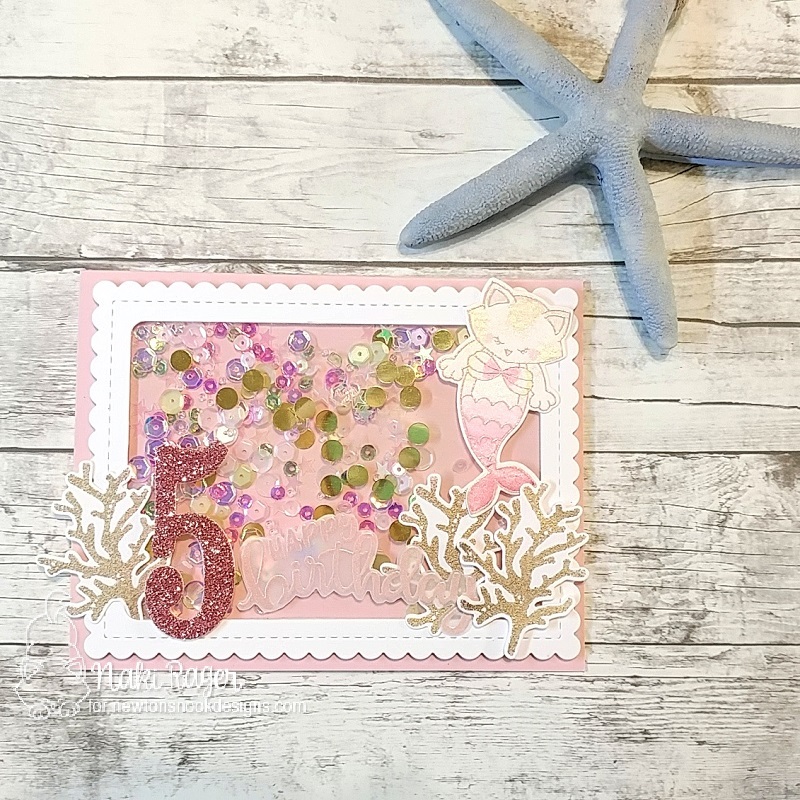 I sponged the background with Tattered Rose and Picked Raspberry Distress Oxide Inks. 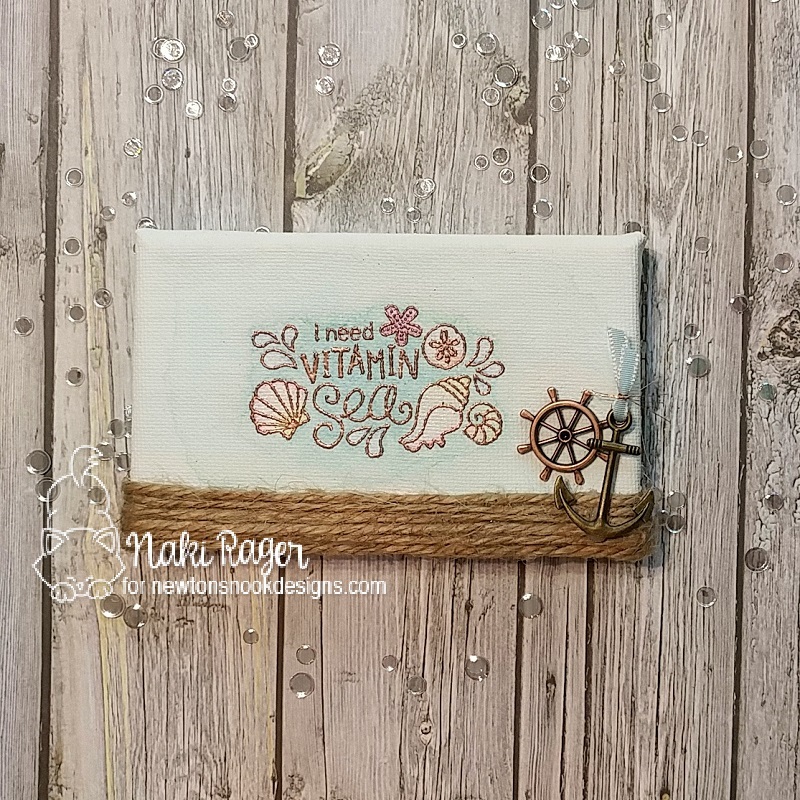 I can't quite get a hang of spraying Distress Mica Spray so I actually dipped a paint brush in the bottle and splattered it! I think I like it a lot! 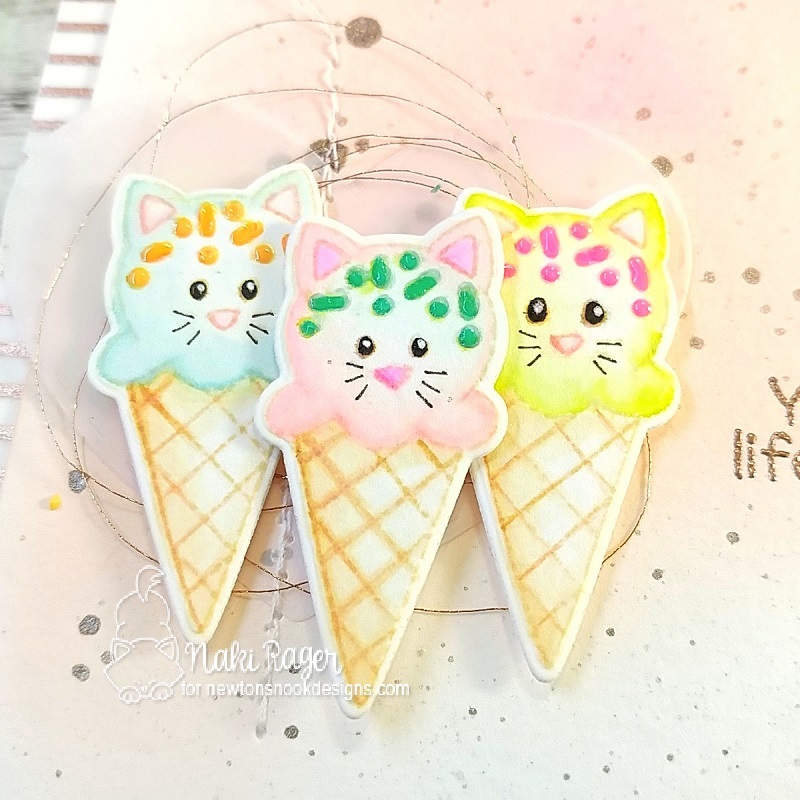 I did some no-line watercolor with these cuties, then colored the sprinkles with gel pens, but I didn't like the colors so I covered them up with Nuvo Crystal Drops. It gave some dimensions and shine, love it! 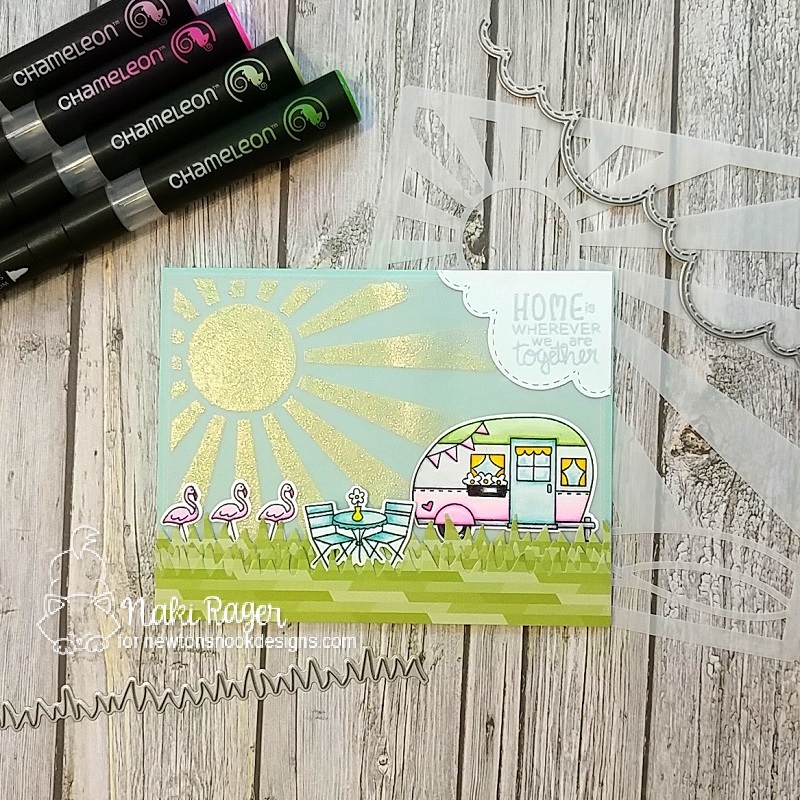 I couldn't have agreed more with this stamp set! He is just minding his own business and totally chilling, I adore his lifestyle! This is also me in the pool, I don't really know how to swim, so I just float in my floaty tube or pool noodles (unless I have to hold one of my kids!). It is so relaxing, isn't it!? 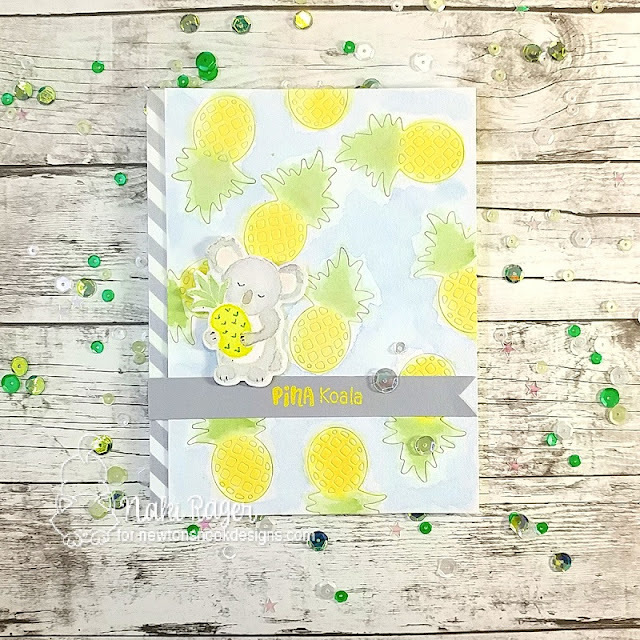 Pineapple has been my all-time favorite, and they make such cute and happy...well, everything! 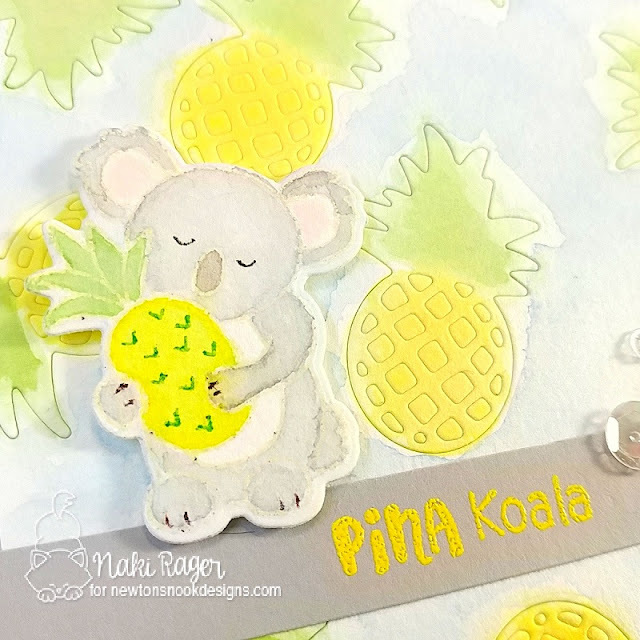 So I made my own pineapple background using this die on 140 lbs watercolor paper. 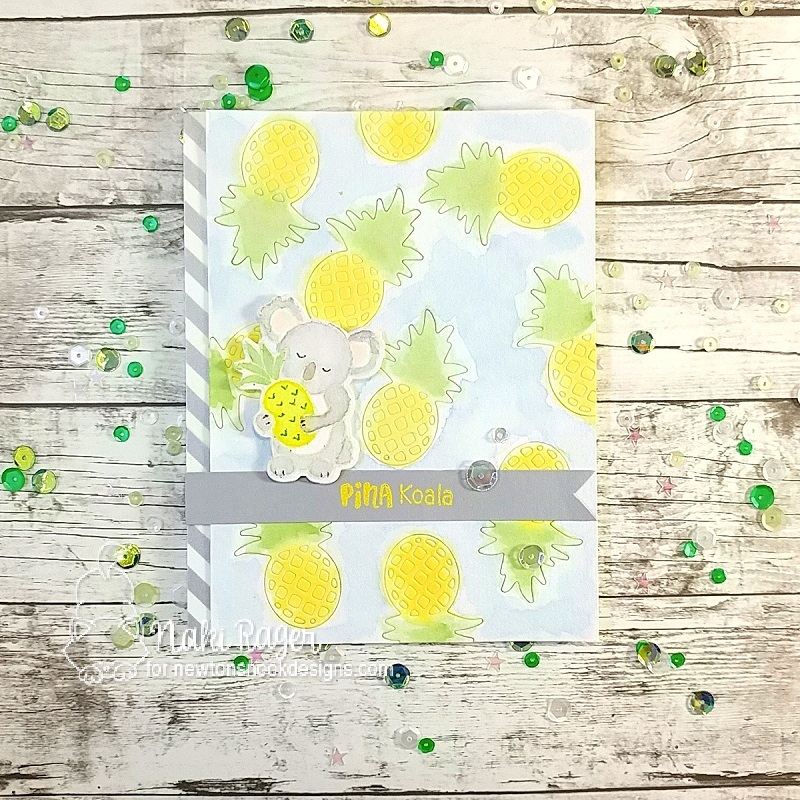 The paper is so thick, I usually have to run at least twice to completely cut through, but for this, I only ran once to keep the pineapples in the panel. then I did some sloppy, wet-on-wet watercoloring and let it sit to dry. And you know what, I do! I really, really do!! I need Vitamin Sea!!! As soon as I saw this adorable stamp, I wanted to make a little sign! hope you enjoyed the reveal all week! 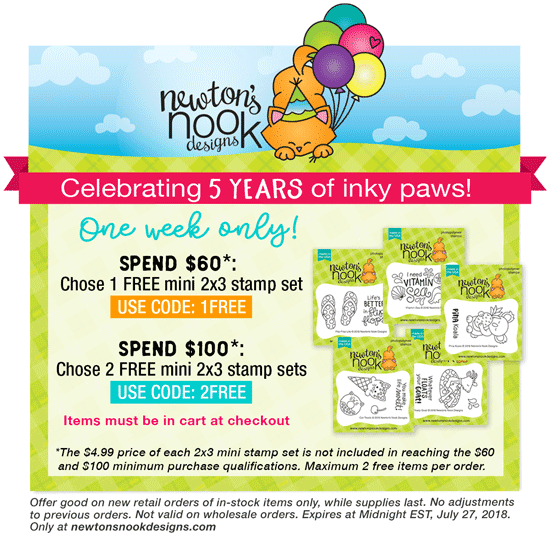 Welcome back to the Newton's Nook Designs 5 Year Celebration! All the new products will be available for purchase this Friday the 20th in the Newton's Nook Designs Shop! 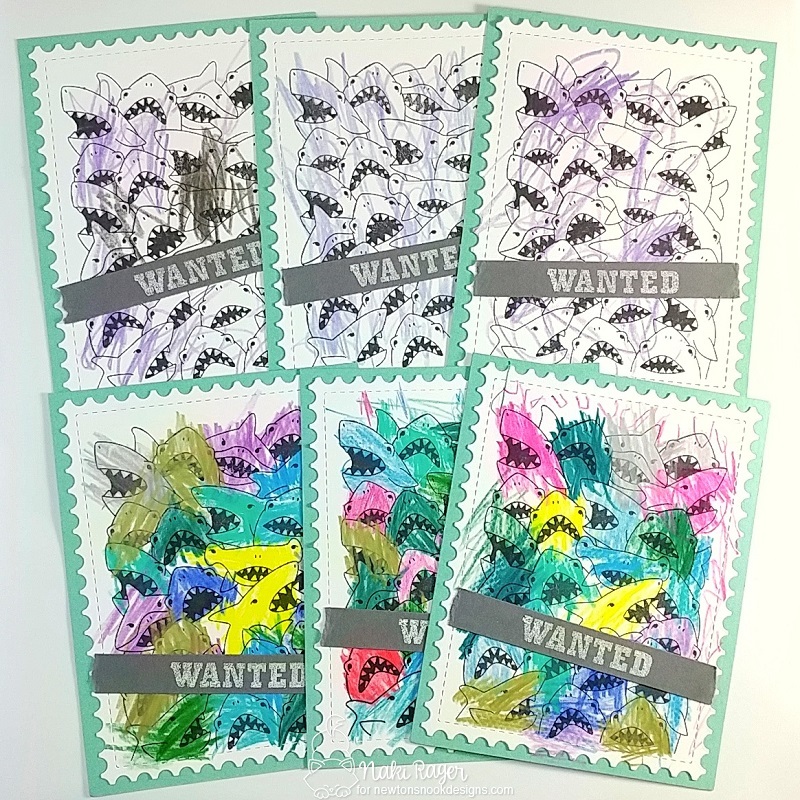 Today we are revealing 2 more stamp sets, Shark Frenzy and Flamingo Flock! 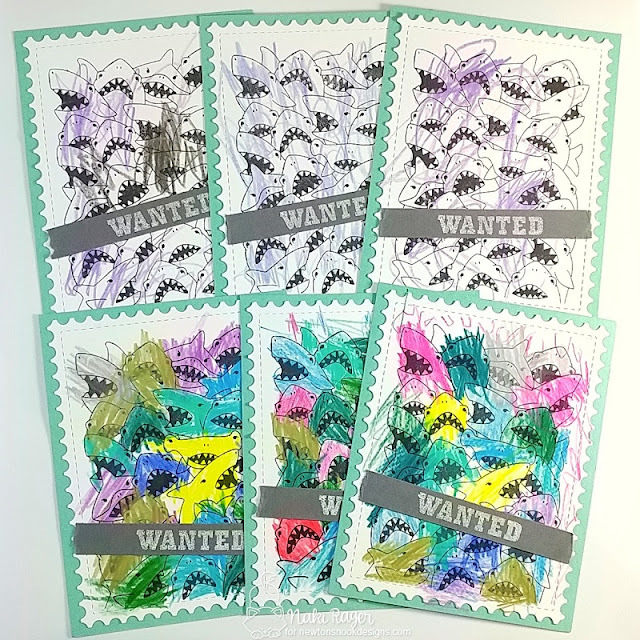 I absolutely LOVE these big stamps! 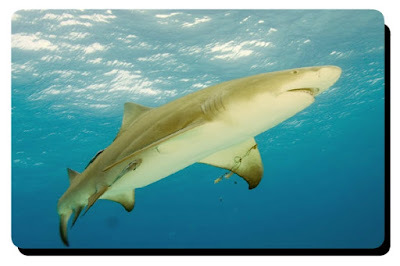 Just like any species, there are many different types of sharks. 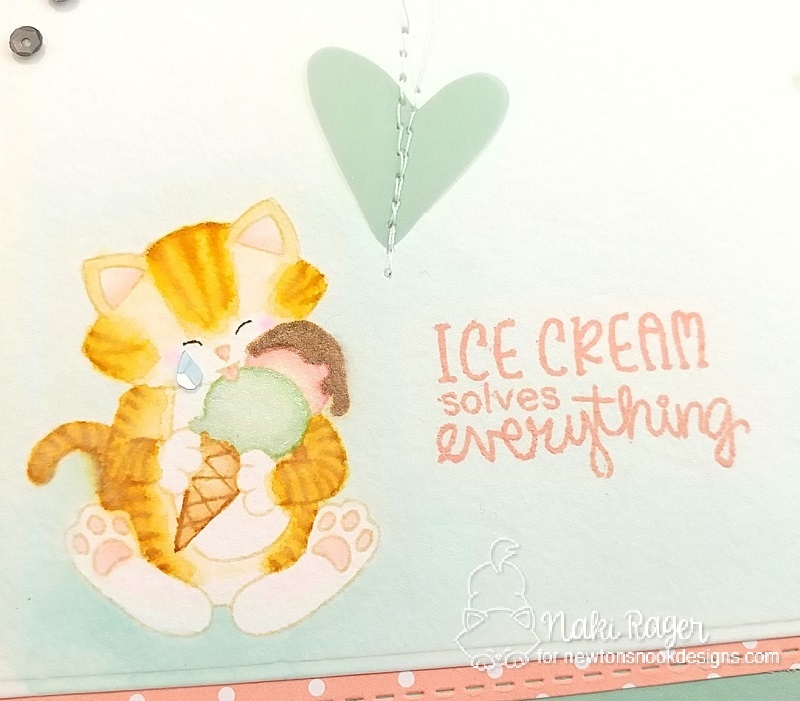 I borrowed the "NOM! NOM! 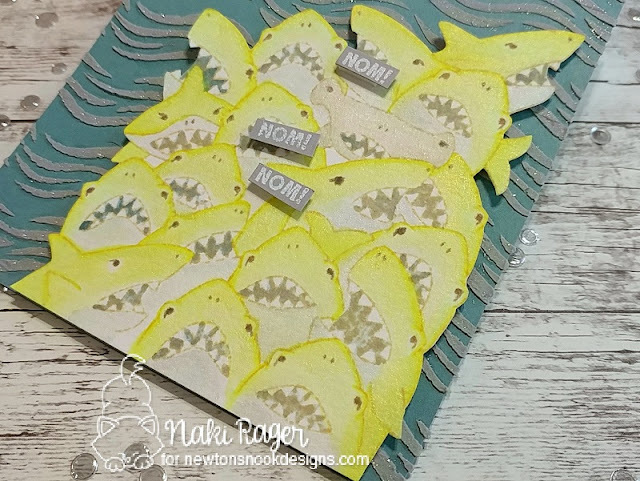 NOM!" 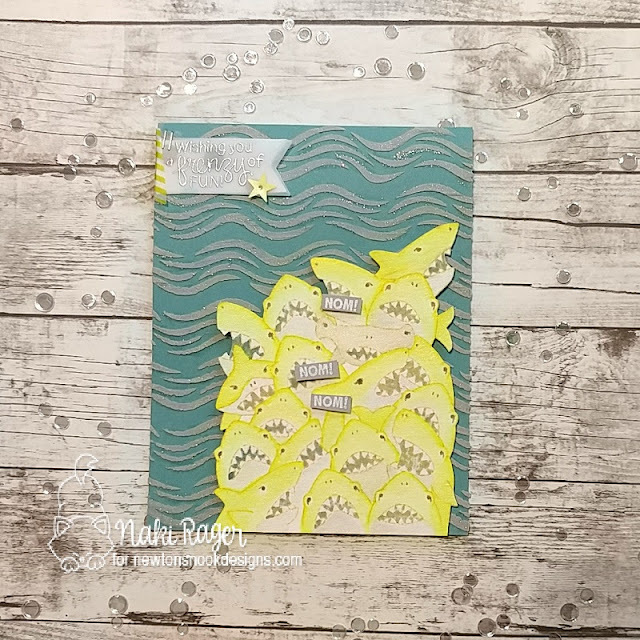 sentiment from the Shark Bites Set and heat embossed with white EP on gray cardstock, then chopped it up into 3 little pieces. 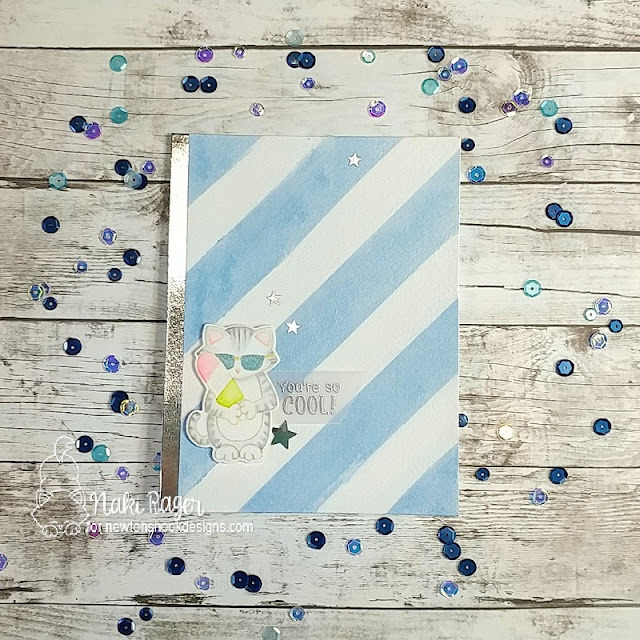 I mixed embossing paste and silver glitter ink from the Stella Glitter Pen to make some waves on the background using the Waves Stencil. The sentiment was heat embossed with Silver EP on vellum, which was die cut with Frames & Flags Die Set. 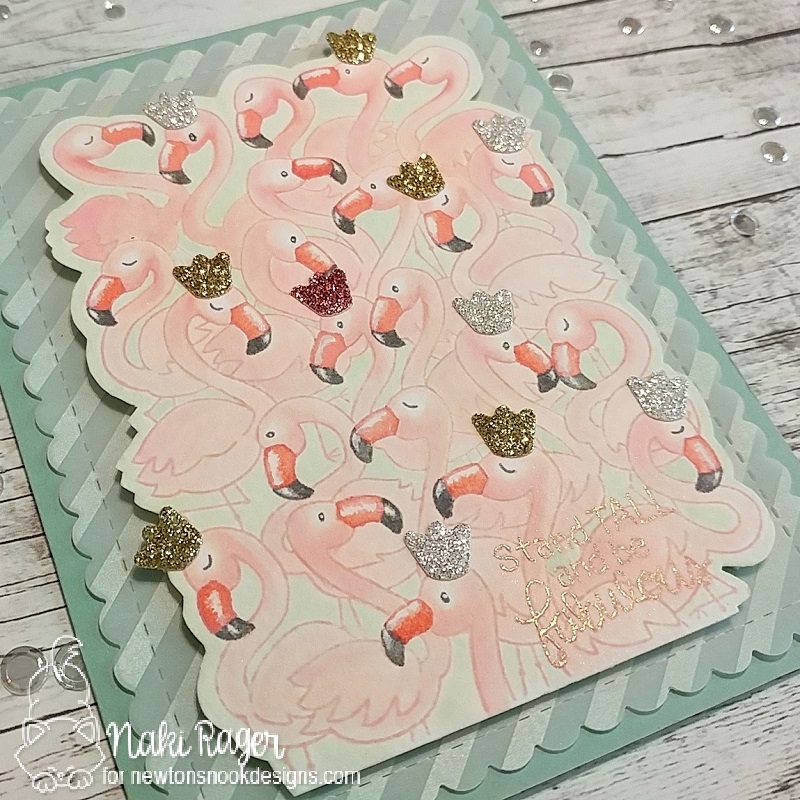 These lovely birds are oh-so "Pretty in Pink", aren't they!? 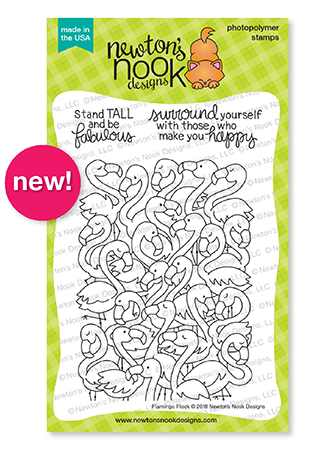 This sentiment is simply fabulous! So fabulous that it gave me an idea to give some of my pink birds the sparkly crowns, which I borrowed from the Once Upon A Princess Die Set. I wanted to give boys bowties, but didn't have any that was the right size! 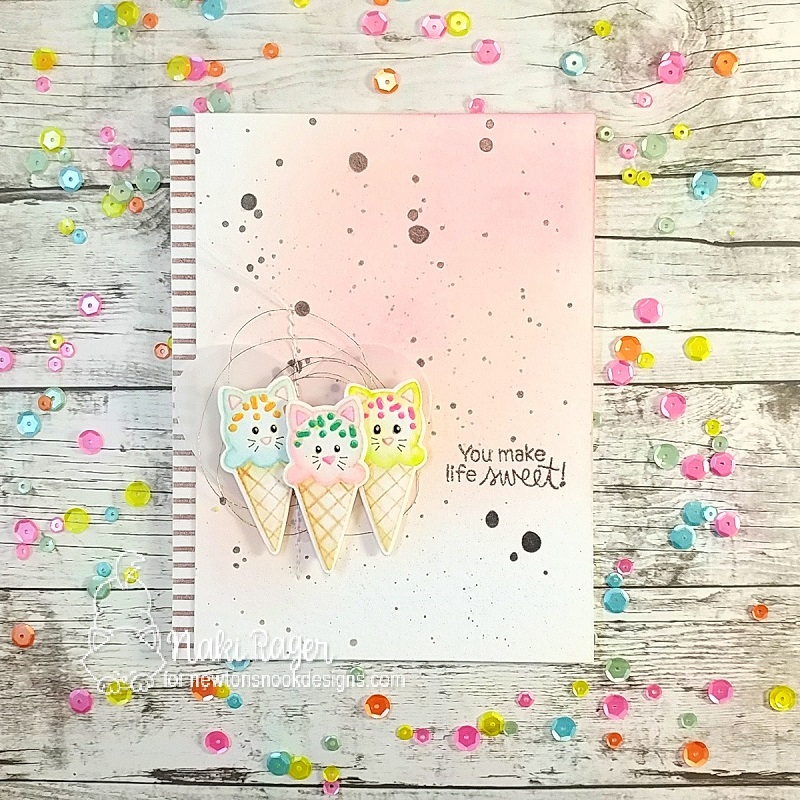 One more day left and you really won't want to miss tomorrow's sneak peek so do come back! 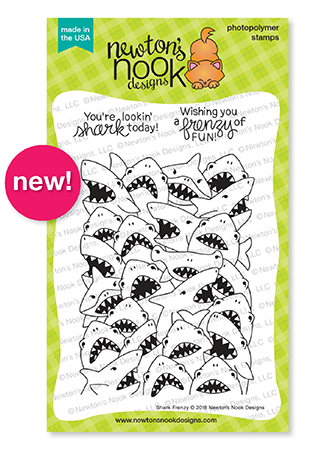 Then the celebration continues and we'll have a hop on Friday! 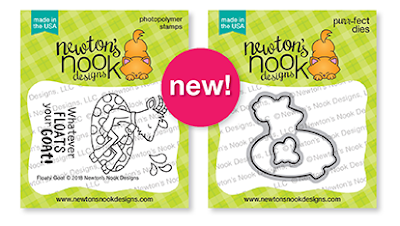 Welcome to day 2 of the Newton's Nook Designs 5 Year Celebration! 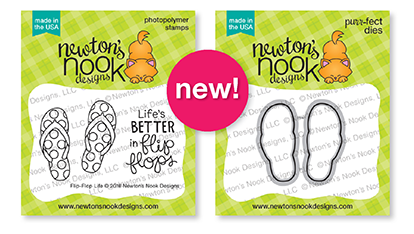 All the new products will be available for purchase this Friday the 20th in the Newton's Nook Designs Shop! 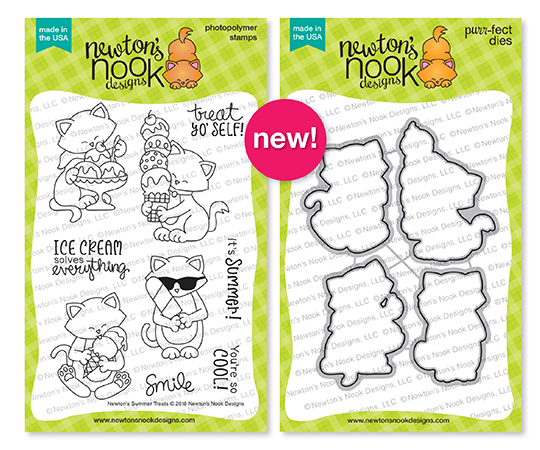 But before you get your hands on them, let's continue the reveal! 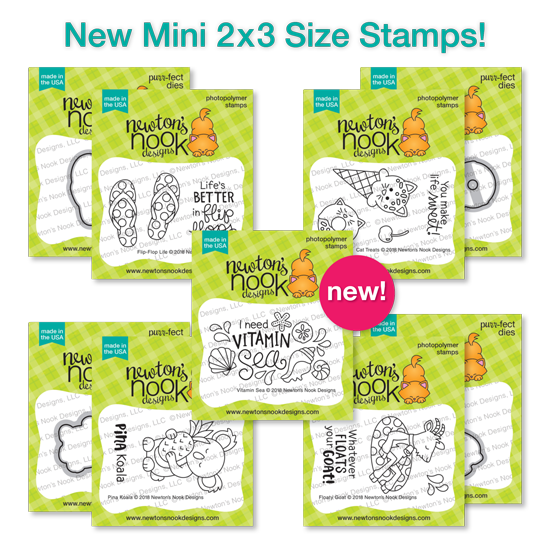 We are showcasing 2 fun stamp set along with their coordinating die set, Newton's Summer Treats and Cozy Campers! Newton and ice cream, what a treat! 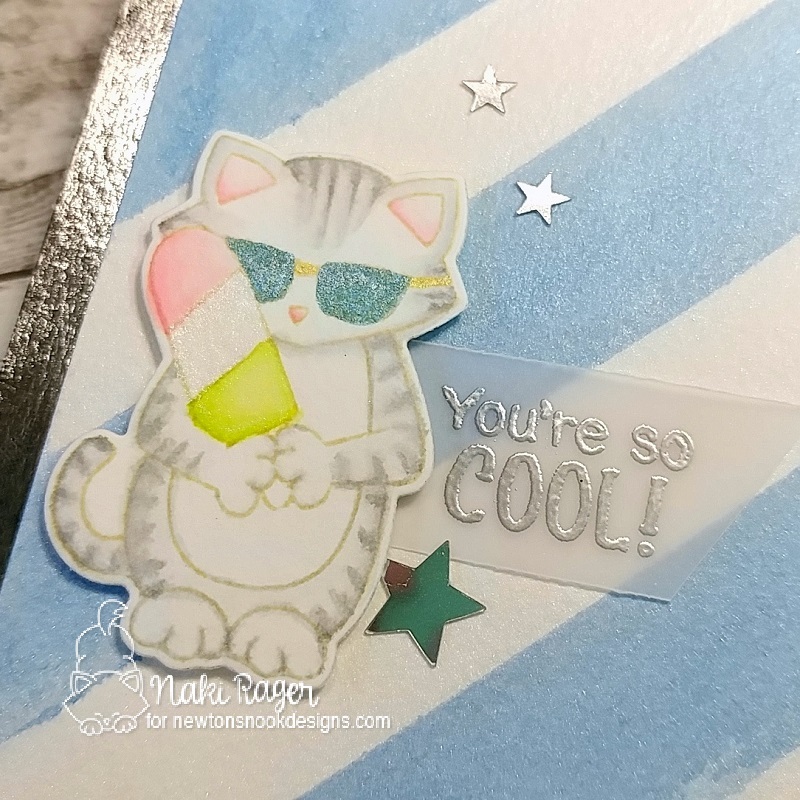 here is another simple but sweet card with the new Newton's Summer Treats. I trimmed down the watercolor paper to 4"x5-1/2" and laid it down on my cutting mat diagonally, placed a few pieces of masking tape every 3/4" to watercolor the stripes. 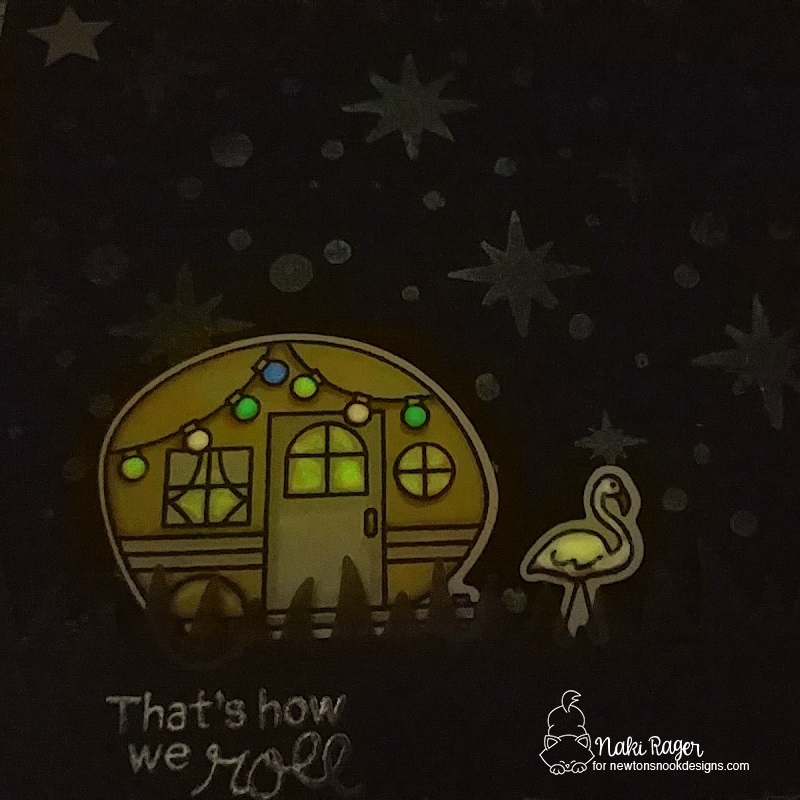 After removing the tape, I went over the whole panel with white pearl watercolor. 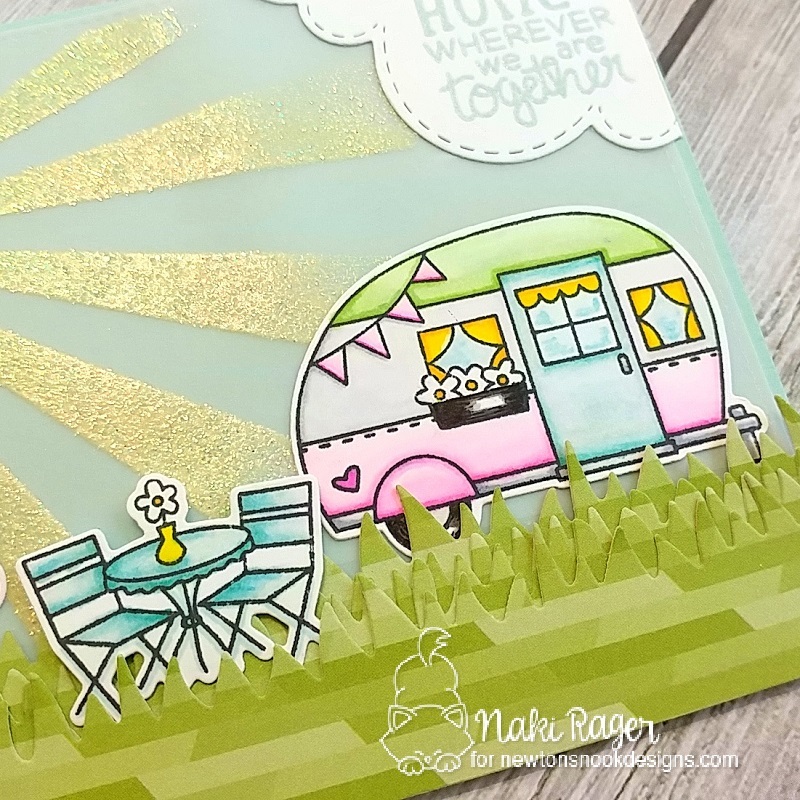 I've only gone camping once in my life (that was enough for me! 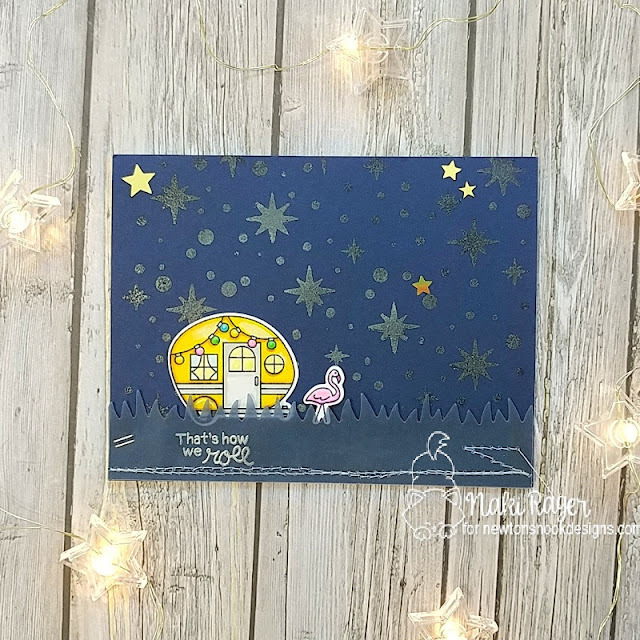 LOL), and seeing the beautiful clear sky that displayed countless stars was simply breathtaking for a girl who was growing up in a busy city! So that was my inspiration for this card. 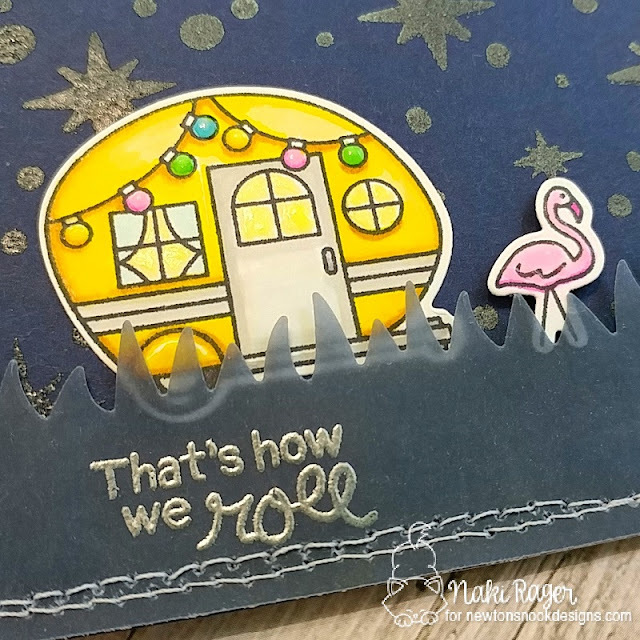 This adorable little camper and my favorite plastic flamingo were stamped with Black Ink and colored with Chameleon Markers then die cut with the coordinating die set. 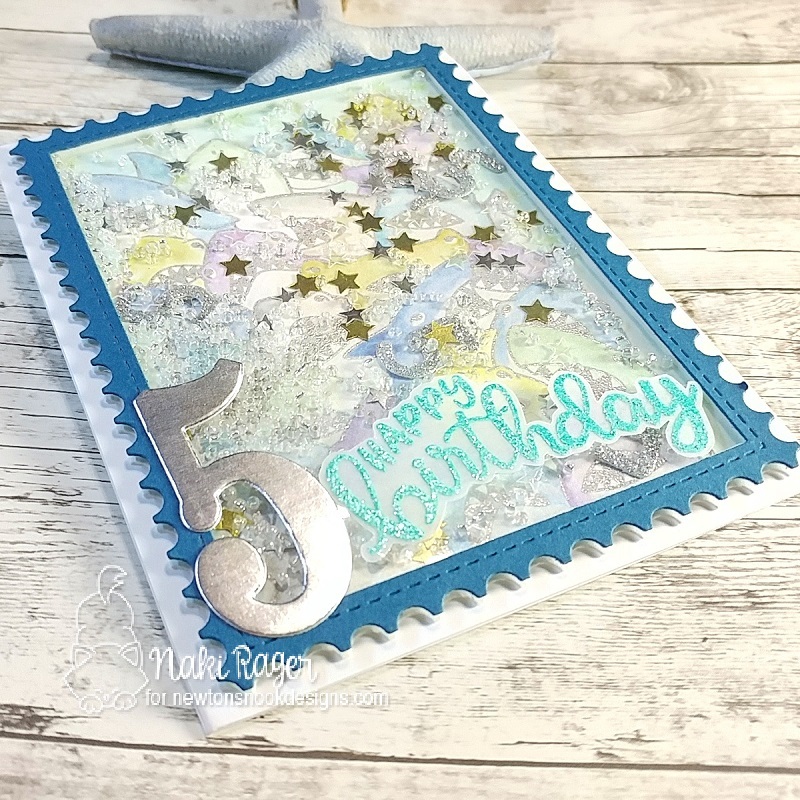 The sentiment was heat embossed with Silver EP on navy vellum, which was die cut using the Land Borders Die Set. My second card with the Cozy Camper Set takes a place the opposite of my first card. I thought adding some sunrays using the Sunscape Stencil and Gold Tinsel EP on vellum would make a fun background! If I ever were to own a camper, I'd totally have it painted and decorated cute and bright! The little patio set is so adorable, too! 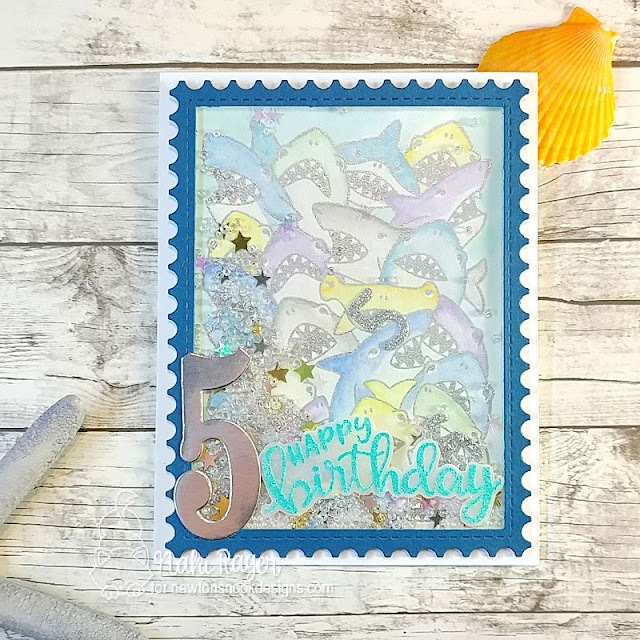 💙 All the images were stamped with black ink and colored in with Chameleon Markers then die cut with the coordinating dies. 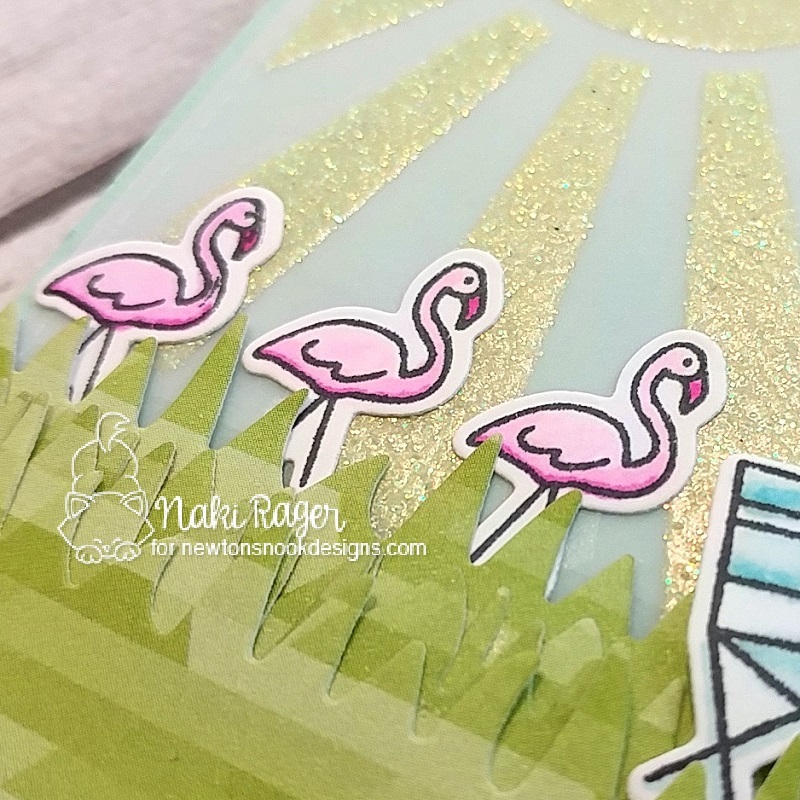 The grass was die cut with the Land Borders Die Set from this patterned paper and layered on different levels to give dimension. 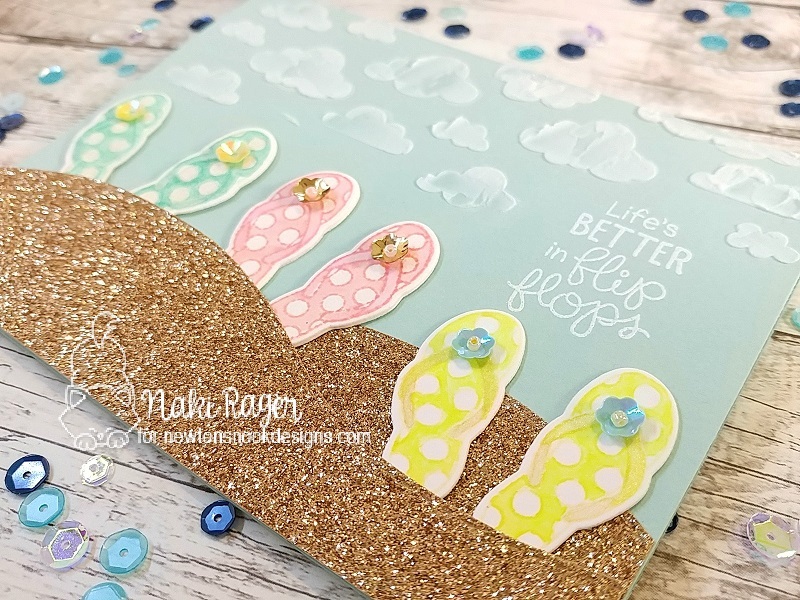 I like my sentiments casually blend in my designs so for this card, I used the Sky Borders Die Set to create this little puffy cloud that sits nicely in the corner. We still have 2 more days of the reveal left and you really won't want to miss them so make sure to come back!